This technical note describes some easy steps to access specific transcripts within Lexbe eDiscovery Suite Platform. >Filter Quick Links (Shared Function): All the columns (Built-In and Custom Doc Fields) in Lexbe eDiscovery Suite Platform can be filtered from the Filters>Select Filters section. You can filter your results down to a specific division or document type by applying filters. For example filtering on documents by Document Type (Exhibit, Transcript, Transcript w/Linked Exhibits, etc. ), to identify documents you wish to review and narrow down your search results, showing only a subset of relevant results. A list of all the filters are automatically saved in the database whenever you click on the ‘Apply’ button in the Filter. This feature also allows you to share or unshare your own filters with users in the current case by clicking on the 'Edit' button, and then when the Shared/Pinned Filters dialog box appears check or uncheck the 'shared' icon check-box. Please note that this option will share your filters with all current users that have access to the case. The Search page helps you find specific documents based on the text or keywords in all your documents or helps you to find key documents with various options. 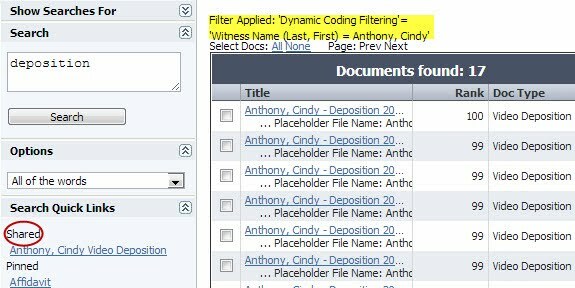 You can also setup a filter before entering any keywords in the search box for further narrowing down the results (e.g., Filter Applied: 'Dynamic Coding Filtering'= 'Witness Name (Last, First) = Anthony, Cindy'). "Cancel" under the 'Search Quick Links' section. Please note that this option will share your searches with all current users that have access to the case. From the Browse, Search and Facts & Issues pages, you can select documents and tags that can be exported to an Excel spreadsheet. The Excel log allows you to generate a report that can be filtered, sorted for further analysis in Excel. 1-Each document in the table view of documents has a check mark to the left of the document. Documents on a page can be selected one at a time this way. NOTE: These check marks persist for the page only and are lost if you navigate to another page. 2-All documents displayed on a page can be selected all at once by selecting 'Select Docs: All' hyperlink at the top of the page. 3-The main table from the Browse only displays the first 25 documents per page, but the entire database is selected. If you want to download only 25 documents from the current case, click on the link "Page". At that point a message and link will appear at the top of the page showing you that all documents in list have been selected. After selecting documents in any of the ways, multiple document operation scan be done: e.g., multi-doc edit, export, delete. If you have questions regarding case access, new user, setting up new cases and uploading documents, please contact the Account Admin User that has full control over the account and users, and is also responsible for managing the case you are working on. If you are experiencing other technical problems, please submit a support ticket to our customer service. Please also let us know if we can be of further assistance and also if you have any comments or suggestions, they would be greatly appreciated.